Is your commercial kitchen floor ready for hot and cold extreme temperatures? Old man winter is in full force. Even sunny Florida was snowed on this week. As winter storm Maximus chases winter storm Leon across the country from California to New York to Massachusetts (and even in the sunny south) – what happens when it chases cold snow and ice right onto your hot commercial kitchen flooring? Exercising great taste and immeasurable savviness, he had Everlast Epoxy floors installed. 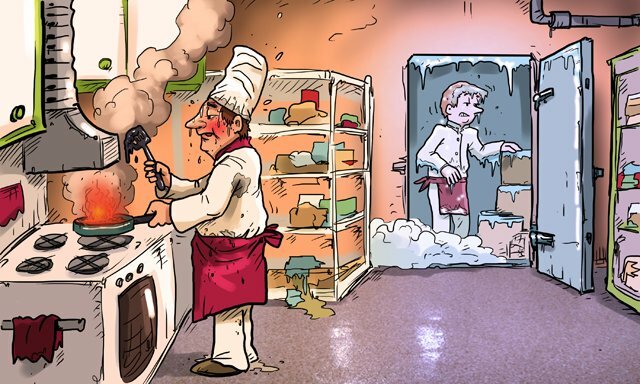 Now, the ovens blaze to the full extent of their power and the freezer temperatures are happily bone-chilling, while the floors beneath them remain strong and healthy, enduring whatever temperatures are thrown their way – above and beyond, it seems, what even the staff can handle. Now it’s your turn! Don’t worry about the weather inside or out. Get you some commercial kitchen epoxy floors that can withstand hot and cold extreme temperatures.